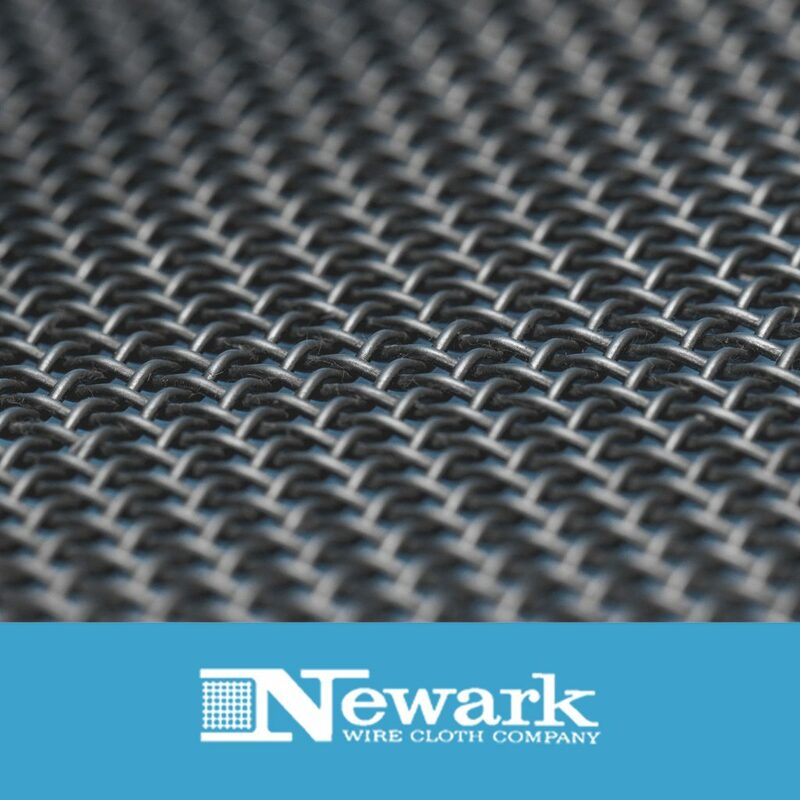 The Newark Wire Cloth Company is one of the top manufacturers for all types of sieves in the industry. 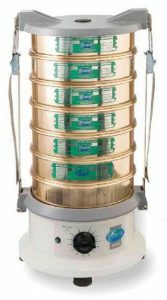 We offer ‘superior’ quality Test Sieves; featuring our exclusive ‘Cleaner-by-Design’ construction, trademarked as our SuperlaSieveTM technology. 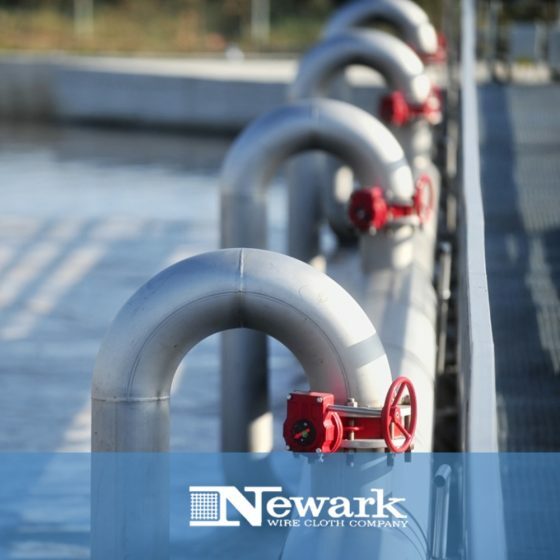 Newark’s SuperlaSieve technology was designed and developed in response to customer demand for better quality test sieves; cleaner, crevice free, and durable construction! When we searched for the proper name for our Test Sieves we consulted Webster’s Dictionary. Webster’s defines Superlative as … ”very high quality, surpassing all others”. Today, all Newark Wire Cloth manufactured stainless steel test sieves fall under the SuperlaSieveumbrella; whether UV Adhesive, Pure Tin Soldered, or Welded construction. All standard sieve frames are die stamped for quality – your assurance of consistency, fit, and function from sieve to sieve. Sieve frames stamped using 22 ga. Sheet metal – in some cases 37% thicker than the sieve frames found on competitors test sieves. 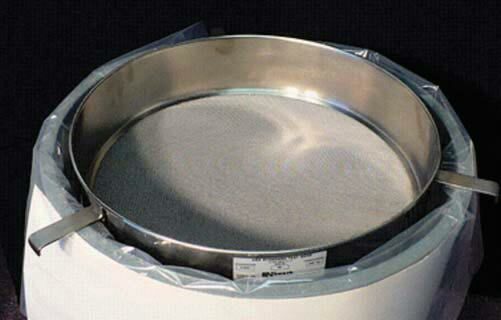 Stainless Steel Sieve Cloth conforming to ASTM E11 or ISO 3310 specifications. 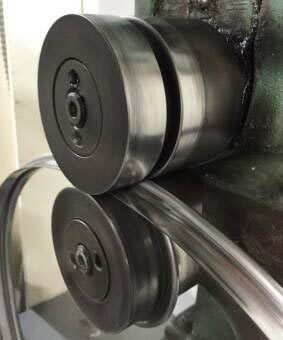 Test Sieve frame is polished – Inside and Out! 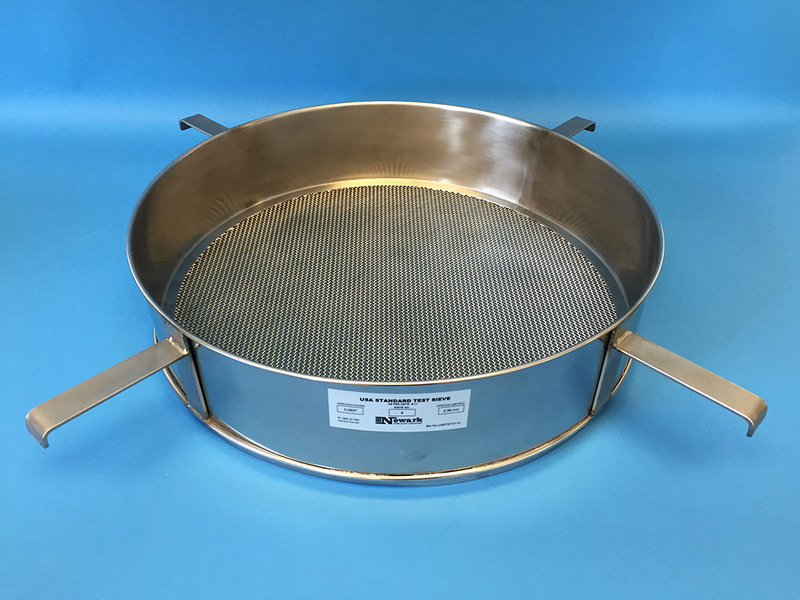 Test Sieve construction features a ‘clean and smooth’ transition from the side wall of the sieve frame to the sieving surface – there is no epoxy bead for product to get caught. 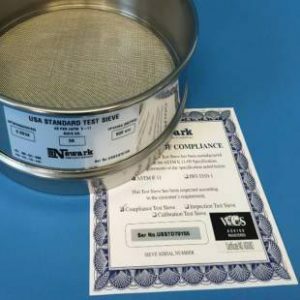 Every Test Sieve is identified with a Serial Number and a matching Test Sieve Certificate of Compliance. All Test Sieves are individually boxed. All boxes are labeled. 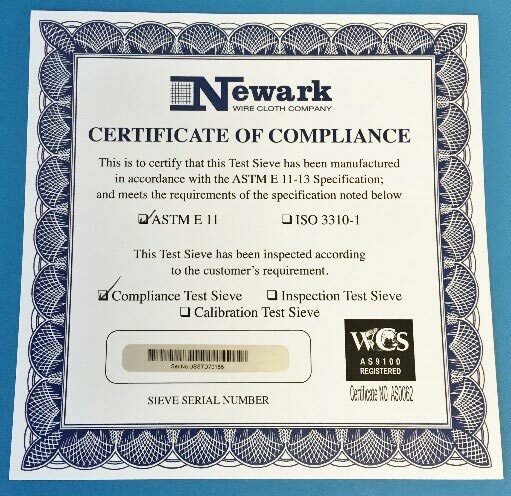 Newark Wire Cloth’s Stainless Steel Test Sieves are manufactured using 300 series stainless steel. Unless otherwise specified the sieve frames are manufactured using 304 SS. They can also be fabricated using either 304L SS, 316 SS or 316L SS but these would be considered a special order. The ASTM E11 Sieve Cloth is typically supplied in 304 SS, but is often available in 304L SS, 316 SS, or 316L SS. If a 300 series stainless steel other than 304 SS is required please check with one of our customer service sales consultants as to its availability. For years Brass had been less expensive than Stainless Steel. However, in today’s metals market the price of Brass (due to its Copper content) has gradually caught up to, and passed Stainless Steel material costs. Many of the ASTM E11 specifications are woven in Stainless Steel only. Brass oxidizes, meaning it tarnishes over time; any Brass sieves in stock, need to be polished a second time before shipping. Customers are not expecting their new Brass sieve to be tarnished when they receive it. Stainless Steel is more durable in terms of abrasion resistance. Brass is a ‘softer’ metal. Stainless Steel is more corrosion resistant than Brass. 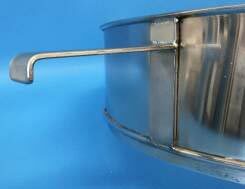 Stainless Steel is preferred for wet sieving and for food and pharmaceutical applications. 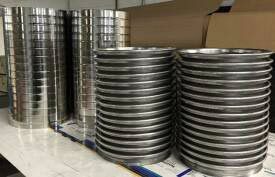 Stainless Steel is also ‘stronger’ and preferred for larger diameter test sieves. 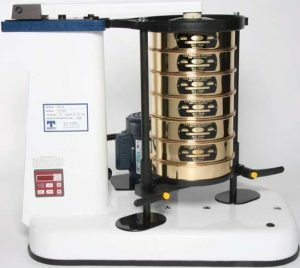 Pure Tin Soldered Test Sieves are assembled using Pure Tin Solder to secure the sieve cloth to the test sieve frame. Most Pharmaceutical, Food, and Beverage applications permit the use of Test Sieves fabricated with Pure Tin Solder. 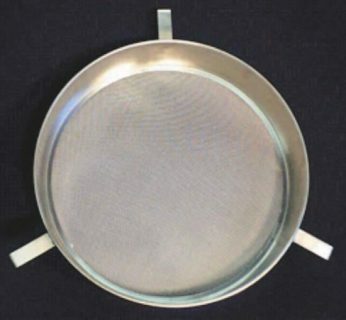 Evidence of the Pure Tin Solder is virtually absent from the interior surfaces of the test sieve; the sieve cloth is secured to the underside of the sieve frame. 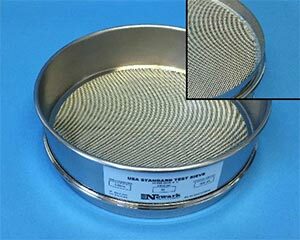 Pure Tin Soldered Test Sieves can be used for most ‘wet sieving’ and ‘dry sieving’ applications. 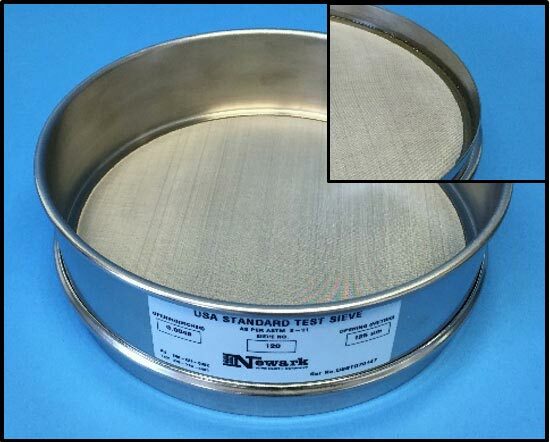 Pure Tin Soldered Test Sieves should not be used when temperatures are greater than 350oF. 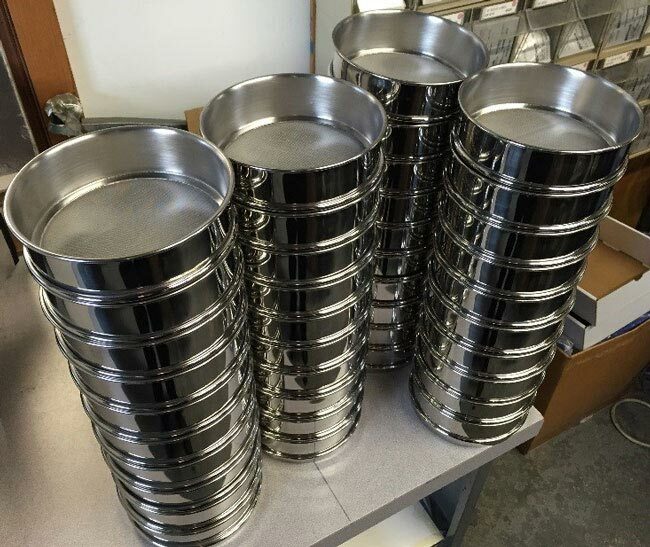 Stainless Steel Frame / Stainless Steel Cloth Test Sieves fabricated using Pure Tin Soldered Test Sieves are FDA compliant. NOTE: Pure Tin Soldered Test Sieves are not recommended for exposure to a caustic cleaning solution or acid as the Pure Tin Solder will break down over time. We recommend using welded Test Sieve when these conditions exist. UV Adhesive Test Sieves are assembled using a proprietary state-of-the-art polymeric adhesive to secure the sieve cloth to the test sieve frame. It effectively seals the joint between the sieve cloth and the test sieve frame. Similar to the Pure Tin Soldered construction, the UV Adhesive is virtually absent from the interior surfaces of the test sieve; the sieve cloth is secured to the underside of the sieve frame. 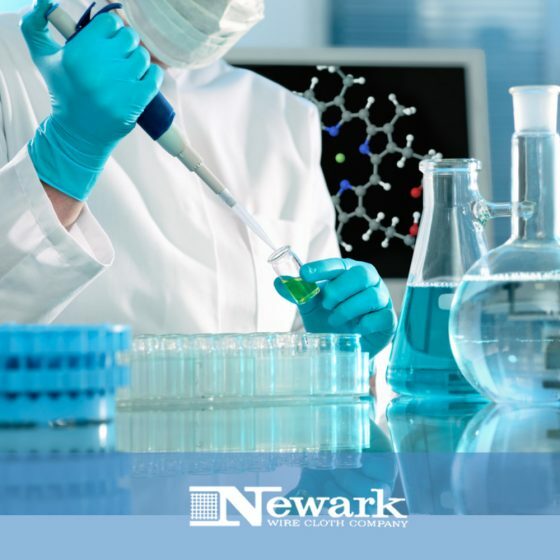 This adhesive has been laboratory tested and certified to be in compliance with UPS Biological Reactivity Tests in Vivo USP Plastics Class VI. 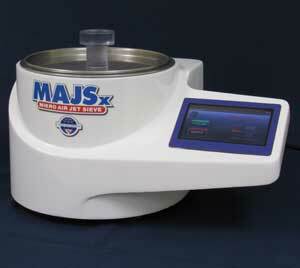 A UV Adhesive Test Sieve is autoclaveable! 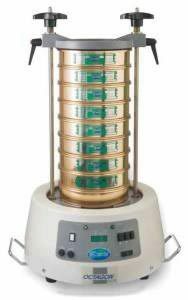 NOTE: UV Adhesive Test Sieves are not the best choice if you’re looking for laboratory test sieves to use for ‘wet sieving’ or for applications with significant humidity or moisture; as the adhesive bond between the sieve cloth and the test sieve frame can break down and become weak over time. A UV Adhesive Test Sieve is a perfect choice for most dry sieving applications. A welded Test Sieve has the sieve cloth continuously resistance spot to the sieve frame. The individual spot welds are overlapped, no voids thus ensuring that all product goes through the sieve screen, not around it. The Sieve Cloth is welded directly to the sieve frame; no filler metal is used. Whether a coarse mesh sieve or a fine mesh sieve all can be supplied in a welded construction. 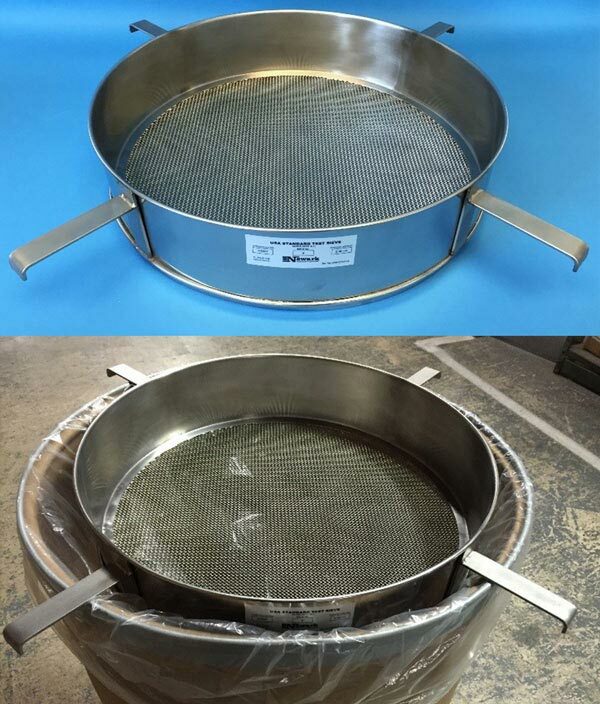 Welded Test Sieves can be used for most ‘wet sieving’ and ‘dry sieving’ applications. They are ideal for critical pharmaceutical applications. ‘Both coarse mesh and fine mesh sieves can be supplied in a welded construction’. Column 3—These numbers are only approximate but are in use for reference; the sieve shall be identified by the standard designation in millimetres or micrometres. Columns 9 and 11—See Annex A1, which specifies that all openings will be inspected for test sieves having 15 openings or less. 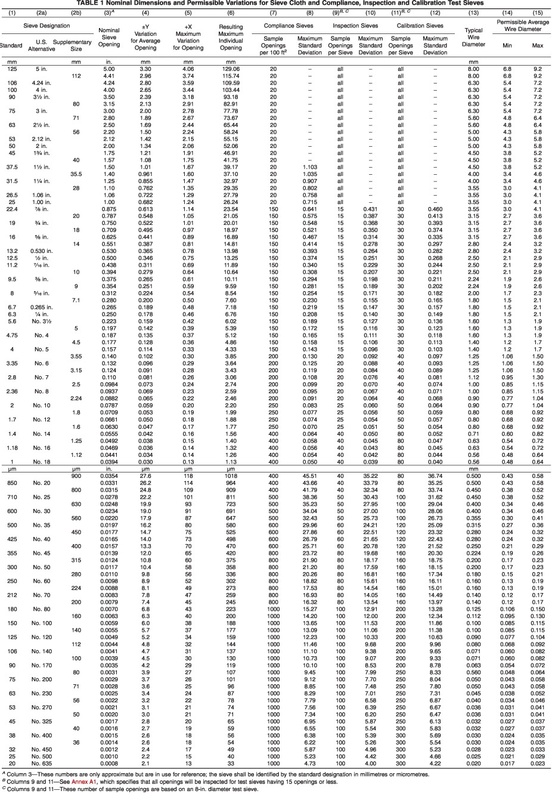 Columns 9 and 11—These number of sample openings are based on an 8-in. diameter test sieve. Be Certain Your Test Sieves Measure Up! Today’s Test Sieves are digitally inspected; openings are measured with a computer aided optical video imaging system linked to custom statistical software. Measurement system is regularly calibrated to NIST traceable standards. 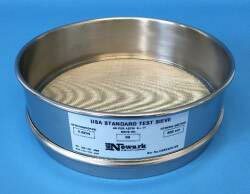 Test Sieves can be supplied certified or re-certified to ASTM E11 or ISO 3310 Specifications. Certification and Re-Certification reporting is presented graphically in a Histogram. 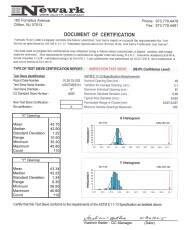 Certification also includes statistical summary information. 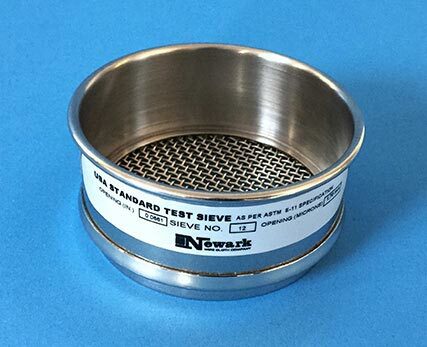 Each Test Sieve is identified with a serial number and supplied with NIST traceable documentation. Each Test Sieve is individually boxed. 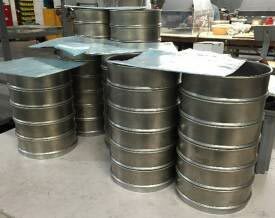 ASTM E11 Test Sieves now manufactured to (3) different confidence levels. 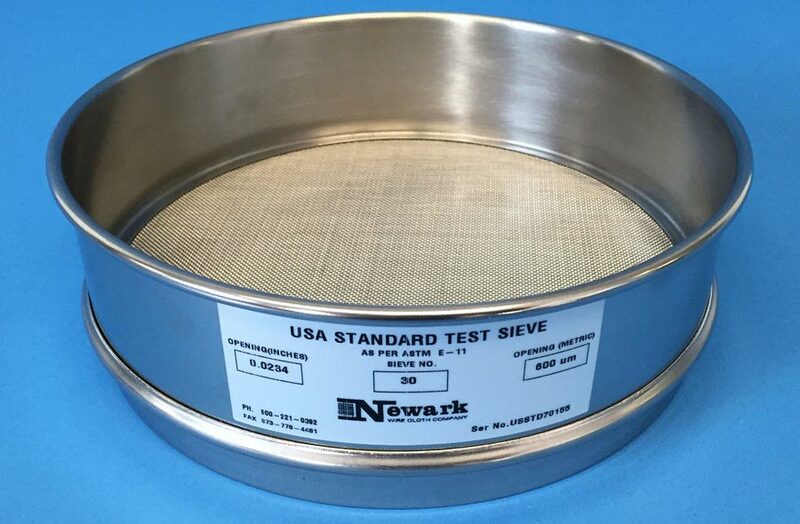 Compliance Test Sieve – supplied to a confidence level of 66%, means that the sieve cloth used in this test sieve was inspected prior to being mounted in the sieve frame; and that it meets the requirements as outlined in Table 1, Column 7 of the ASTM E11 Specification. 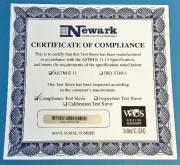 A Certificate of Compliance is included with the Test Sieve when it is shipped. There is no statistical documentation supplied with a Compliance Test Sieve. 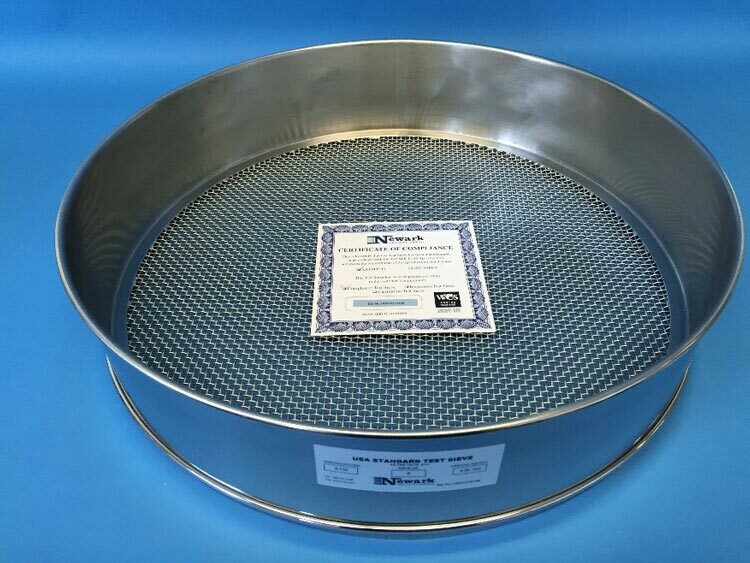 Inspection Test Sieve – supplied to a confidence level of 99%, means that the sieve cloth used in this test sieve was inspected and measured after being mounted in the sieve frame; and that it meets the requirements as outlined in Table 1, Column 9 of the ASTM E11 Specification. The documentation certificate for an Inspection Test Sieve includes (at a minimum) the average opening size when measured in both the warp and shute direction of the sieve cloth. 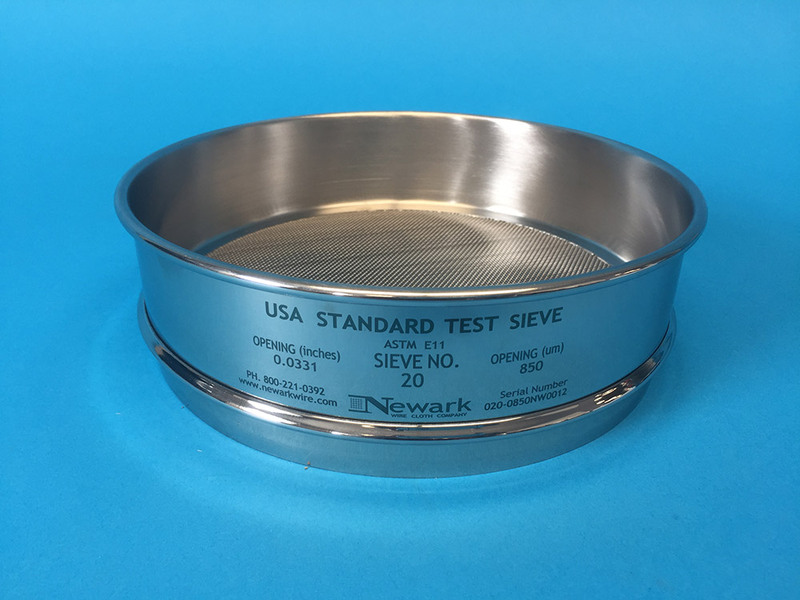 Calibration Test Sieve – supplied to a confidence level of 99.73%, means that the sieve cloth used in this test sieve was inspected and measured after being mounted in the sieve frame; and that it meets the requirements as outlined in Table 1, Column 11 of the ASTM E11 Specification. 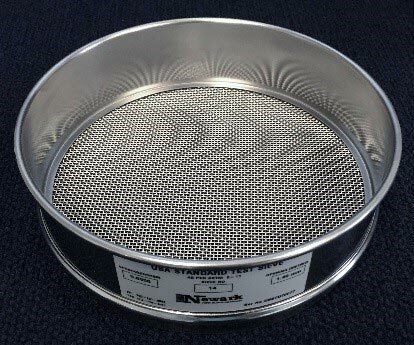 Calibration Test Sieves have at a minimum (for test sieves with a 3/4” opening and smaller) twice as many openings measured as Inspection Test Sieves. For US Std #400 and finer three times as many openings are measured than the Inspection Test Sieves. 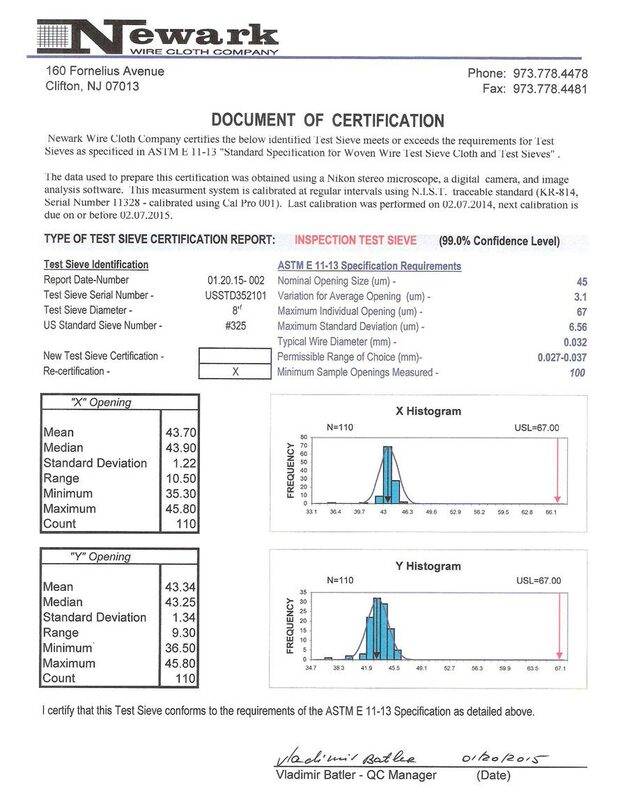 The documentation certificate for an Calibration Test Sieve includes (at a minimum) the number of openings and wire diameters measured, the average opening size and average wire diameter when measured in both the warp and shute direction of the sieve cloth, and the standard deviation. 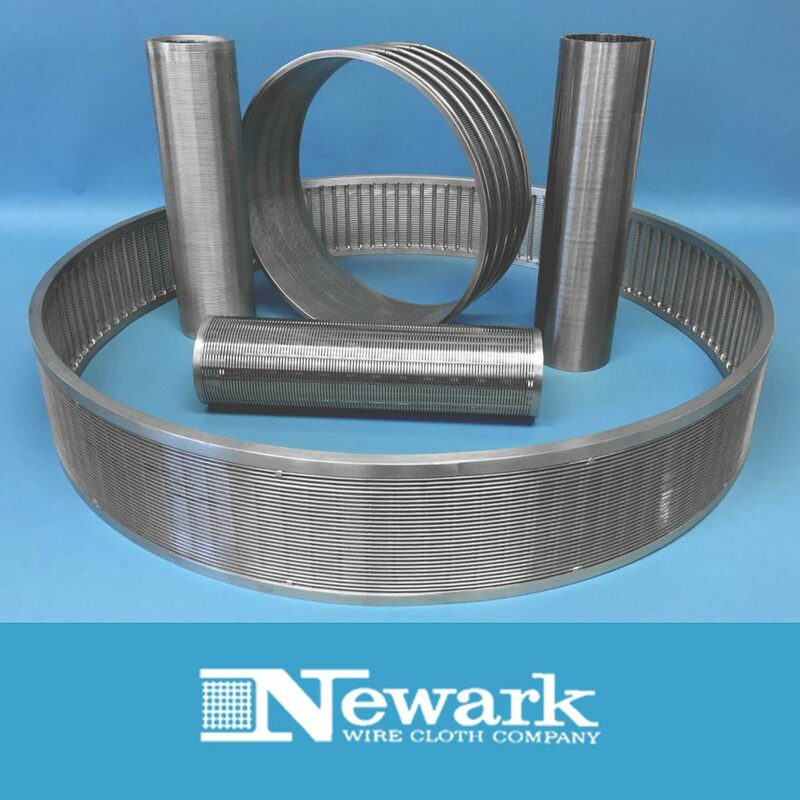 Newark Wire Cloth regularly makes ‘Large Diameter’ Test Sieves; 16’’, 18’’, 24’’ and even larger. 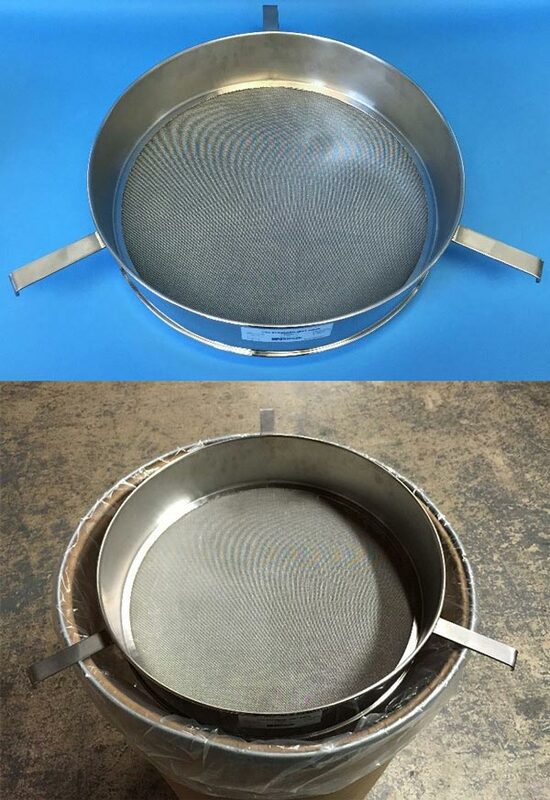 All large diameter Test Sieves are fabricated using our SuperlaSieve techniques to give you a clean and unobstructed sieving area. 18″ dia. 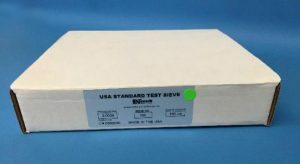 Test Sieve – US Std. #6 as per ASTM E11 w/ Certificate Of Compliance. Pure Tin Soldered construction. 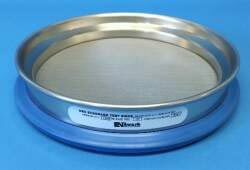 Add Brackets to your Large Diameter Test Sieve. Ideal for a final product quality check when packaging. Fill your fiber drum through a large diameter test sieve, minimize the change of oversized particles or contaminates in the product. Use either (3) or (4) Brackets. Tell us how long you want the brackets to be and we’ll create the correct test sieve sizes to suit your needs. Fabricated using 1/8” x 1” Flat Bar Large Diameter Test Sieve Brackets are welded to the top rolled bead and the rolled bead of the skirt at the bottom of the test sieve. The Brackets are not welded to the light gauge side wall sheet metal of the test sieve frame as they would not be as durable. When requesting brackets we need to know how many brackets you require (3 or 4) and we need to know what diameter the brackets need to span. Bracket Dimensions, the Number of Brackets (3 or 4), the position of the Brackets (relative to the side wall of the Test Sieve frame) are all customized based on the customerʼs requirements. Top View” of 18” diameter Test Sieve – shows equal spacing of the three brackets around the outside of the frame of the Test Sieve. Application – for cleaning all grades (from coarse to fine) of sieve cloth used in Test Sieves, especially suited for cleaning fine mesh sieves; those US Standard #100 or finer. For use with either Stainless Steel or Brass sieve cloth. When used with care the Nylon Bristles will not damage the sieve wire cloth. Description – 2” dia. 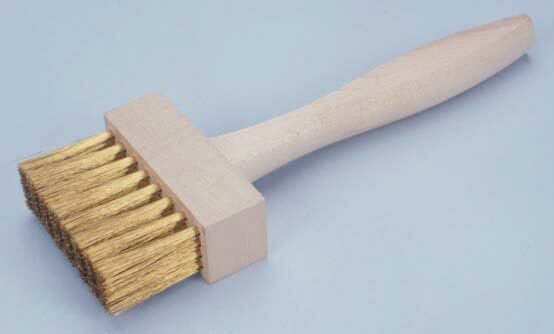 x 1-3/8” long Brush Head with a ¾” dia x 4” long dowel handle. Bristles are 1 ¾” dia. x 1” long. Overall length is 6” long. 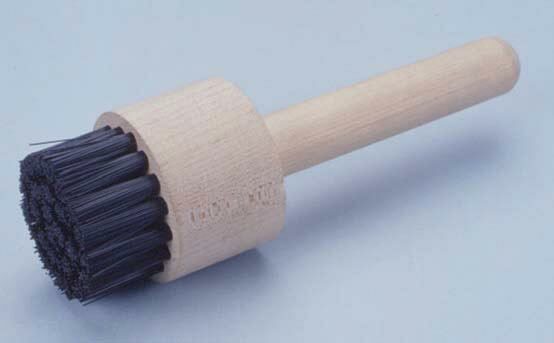 Bristles are Black Nylon, all other components are wood. 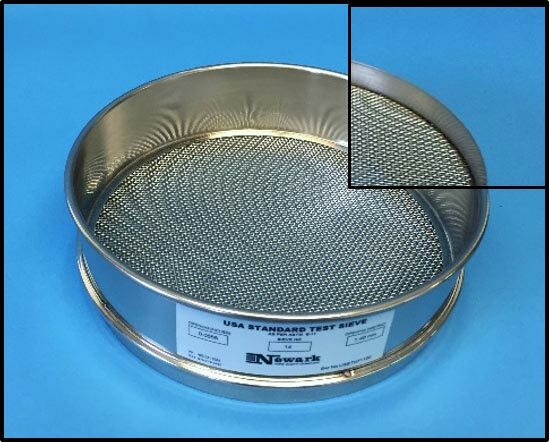 For cleaning coarse mesh Test Sieves, especially those U S Standard #80 and coarser. For use with either Stainless Steel or Brass sieve cloth. Description – 1 1/8” wide x 1” high x 3” long Brush Head with a ¾” dia. x 4” long handle. Bristles are 1 ½” long. Overall length is 6 3/16” long. Bristles are Brass wire, all other components are wood. 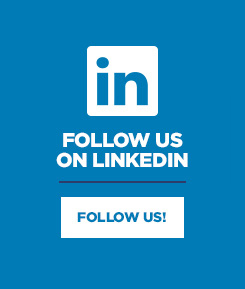 Contact us today for more information on our stainless steel sieves, wire sieves, or any of our other products! Call us at 1-800-221-0392 (US only) or 973-778-4478 or fill out the form below to get in touch with us. What are Test Sieves Used For in the Chemical Industry? © Copyright 2018 Newark Wire Cloth Company. All Rights Reserved.